Walls and how we handle them are pretty important in swimming. There is only one individual event in all of swimming, the long course 50 meter freestyle, that doesn’t involve a turn and pushing off of a wall. How we approach them, how we leave them, our speed in and out, how hard we push…all of these are crucial to our success in handling walls. The wall is a physical barrier that must be dealt with in our sport, but it is also a mental/emotional one. The tendency of most young swimmers is to slow down at the wall, perhaps to catch that extra breath at the turn or in anticipation of the end of the race. One overshot turn resulting in a cracked ankle or banged arm can cause a swimmer to slow in fear around walls for years. It takes a lot of training to master the gut response to see the wall as a stop signal. It is in our nature to slow at a wall, to look up at it, to ponder how to get past it. Our tendency is to assume our path continues on past the wall, following the track we have been on, and that the wall stands in our way. In swim training, we must overcome this mindset: our path does not continue on, but resumes in another direction. The wall becomes a chance to speed up, to readjust, to jump off and speed away on our new path. The wall is not obstacle, but opportunity. In preparation for writing this, I looked up the definition for the word wall, and was interested to find this: an extreme or desperate position or a state of defeat, failure, or ruin.I have certainly faced that kind of wall in my own life, and am facing one now. I have reached my goal of getting all three of my children raised to college age, in college and doing well. All are out of the house, and my path seems to have ended at a giant wall. What now, what next? This wall has been looming for a couple years, and I now stand in front of it, feeling a bit desperate. I cannot see past it. 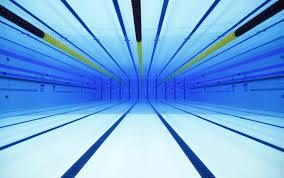 I must return to what I know from swimming: I must speed toward this wall, and see it for the opportunity it is. My path is on a different course, one that I cannot yet see. I need to have the confidence to race at this wall, lower my head, hold my breath, flip and jump as hard as I can in my new direction. The path will be there, and this wall that seems so daunting is my best chance at finding it.